Mordian 7th Regiment: Heresy Era Thousand Sons - Sorcerer Cabal begins! Once the new Thousand Sons plastics were released I fell in love with the Exalted Sorcerers kit - No real surprise there I suppose! I ended up picking up several boxes worth and just couldn't stop building Sorcerers until I reached Tzeentch's favored nine. Now it's time to paint 'em! Sethep-Khet is already done, so I have him out to ensure I'm maintaining the scheme correctly on the next eight! I have a scheme in mind to do a little vignette with Khayon facing off against Ahriman at the height of the casting of the Rubric, we'll see how it pans out! In other news, I've been doing a fair bit of research into transport solutions as I'm going to more destination events these days. While I've been reasonably happy with the Battlefoam PackAir and Pack720, after three or four trips each they're starting to get pretty beat up - the extendable handle on my PackAir no longer functions, and the 720 is suffering some stitching issues. 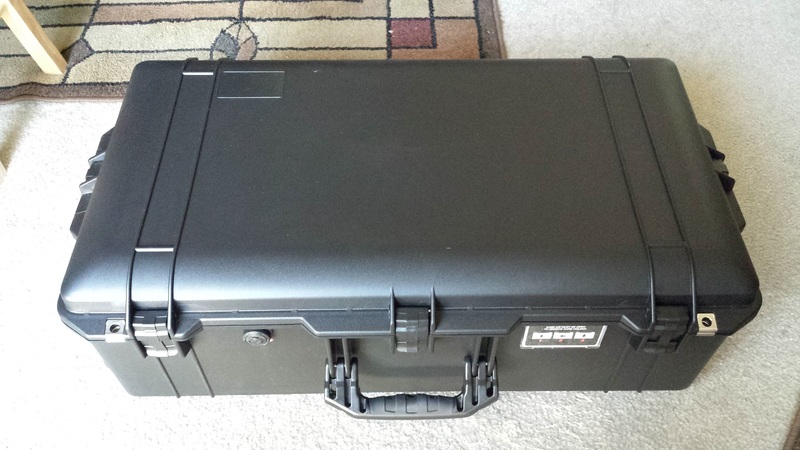 Had a little extra cash squirreled away for a replacement for the Air, and ended up deciding on going for the daddy of transport and picked up a Pelican 1615, which arrived a few days ago! I have to say that I'm well pleased with it so far! 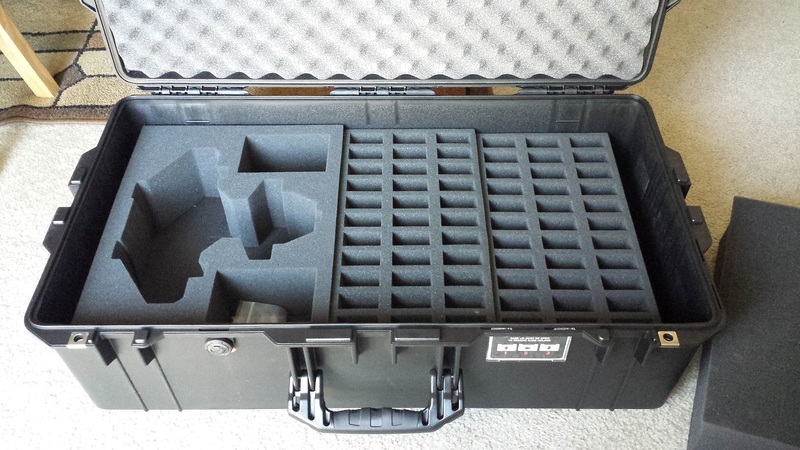 The interior dimensions allow for 6" of trays, with one set of large and two sets of mediums side-by-side. A little shallower than I'd hoped due to the top and bottom foam - there's an inch-thick chunk on the bottom that fits around the wheel and handle insets, as well as an inch and a half of eggshell in the lid, but in the end that's probably best for transport safety anyway! It comes with some very robust-seeming wheels and handle arrangement, time will tell as to how it will hold up, but I have to say I'm not concerned based on Pelican's well-known ruggedness! A bit spendier than the more-or-less-equivalently-sized 1520, but I have a feeling it'll withstand a lot more abuse at the hands of the airline baggage gorillas! Those sorcerers are looking great. I love the new kit they bought out too, so full of character. What will you be using them as in 30k? Can you run 9 sorcerers in a list at all? That case looks like a beast. Definately worth it if you do travel alot. 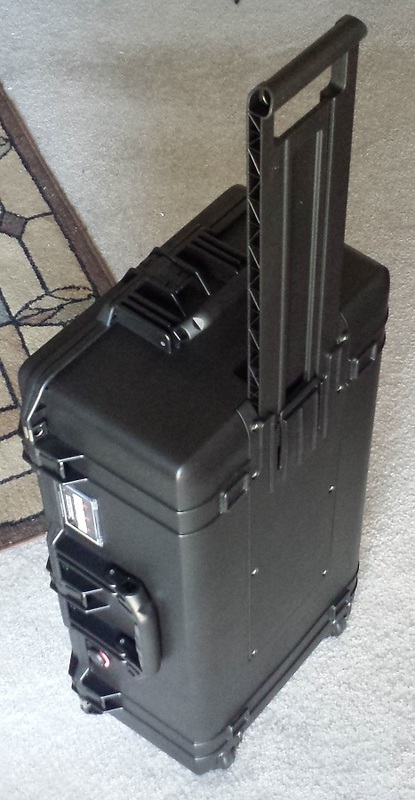 That case looks like it would contain a stinger missile in a bond film. I like the new sorcerers. Lots of dynamic poses. Well played on the sorcerers. A set of nine is a fun way to go for sure. Case looks solid. Surprised the bsttlefoam started giving up on you, I had heard great things about them. @Dai: Indeed! I'm sure the baggage handlers will find some way to compromise it nonetheless!